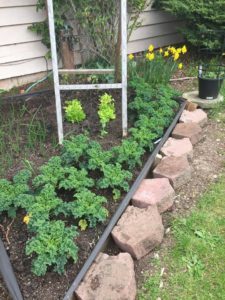 Backyard Chickens, Honey Bees, Gardening. Another busy weekend at the urban farm. There is something about working outdoors that really stirs up the appetite. We ate home-grown eggs, locally harvested oysters and fresh strawberry shortcakes. Our weekend was filled with more big tasks. Since we ordered the new shed, we are working hard to make the site ready. The back corner of our lot was overgrown with blackberries. There was a tree that was infested with bugs that we had cut down a few years ago. Later, we found our shed was also infested with bugs and because life was busy, we abandoned the building. Over time, the blackberries engulfed the building. 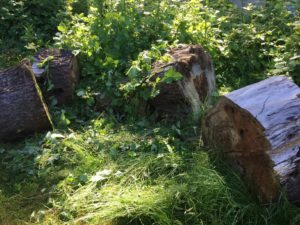 We were left with logs under several feet of blackberry bushes. With the help of family, we rented a wood splitter one weekend and removed the logs. We will now have firewood for the next few years. The next weekend, we borrowed an industrial weed whacker and chopped the blackberries to the ground. 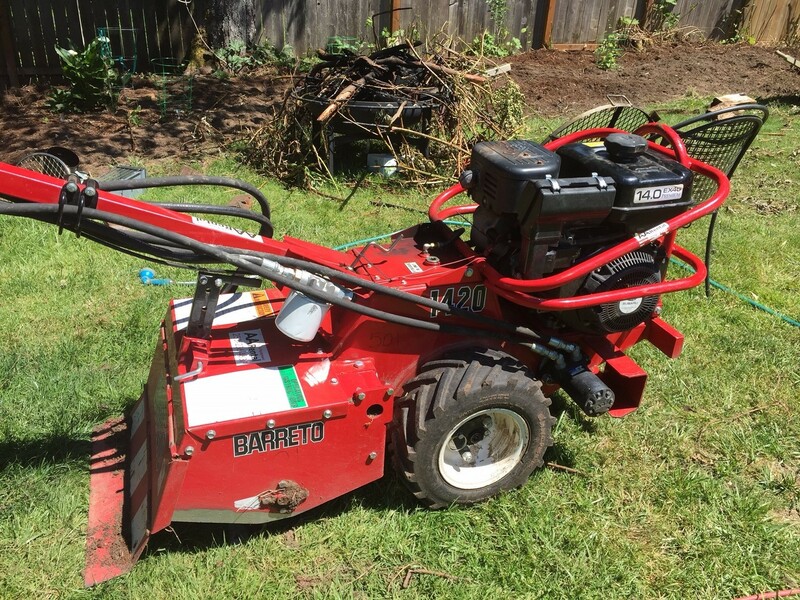 This weekend, we rented a large rototiller and churned the roots up. We went through after the rototiller and pulled as many of the root systems as we could find in the loose dirt. The chickens helped us. They loved finding bugs and worms in the loose soil. 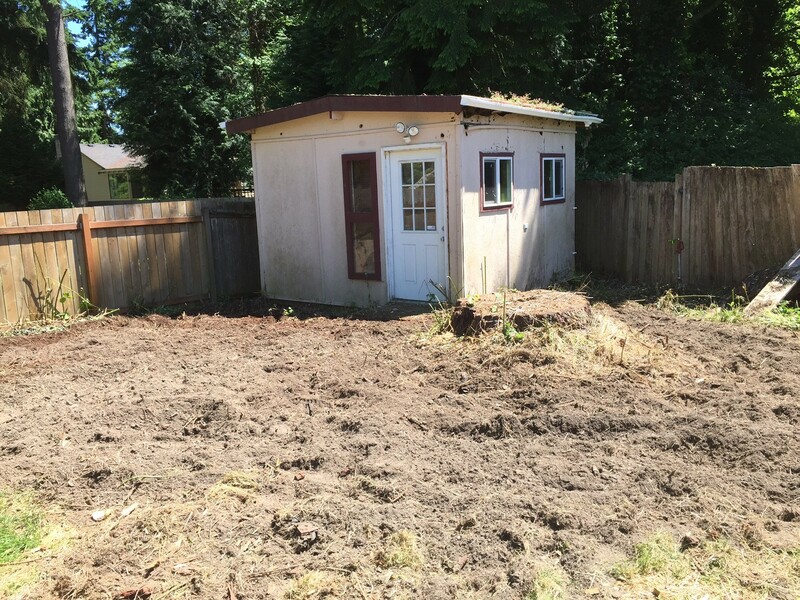 I can hardly wait for the old shed to be torn down and a new barn style shed put up in its place…now what to plan in my newly opened up space? Unlike all of the work we did this weekend, this recipe is simple. I like that the majority of the work is done in advance. This recipe is so easy I wonder why I ever bought that chemical filled easy-whip in the past. Place mixing bowl and electric mixer whisk attachment in freezer until ready to serve dessert. Cut fresh strawberries into small bite-size pieces. In a bowl, mix cut strawberries and two tablespoons of sugar. Stir well. This will encourage the strawberries to release their juices and absorb the sugar. Let rest for a few hours in the refrigerator. Using the chilled mixing bowl and whisk, add whipping cream and start mixer. Slowly add remaining four tablespoons or sugar and vanilla. Mix until stiff peaks form. 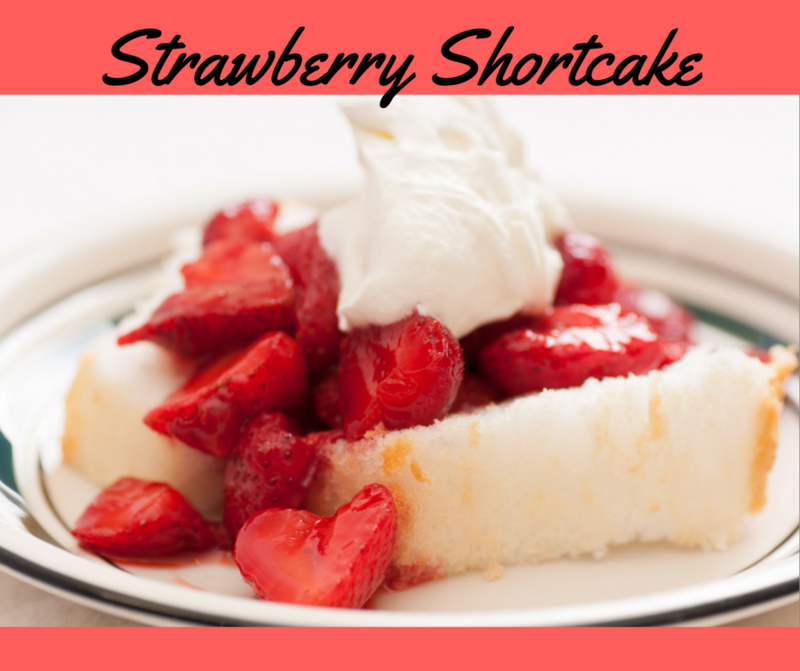 Assemble shortcakes with angel food cake as the bottom layer, strawberries and a large dollop of whipped cream on top. Enjoy! Every morning I walk out my front door to kale! What a difference a few weeks makes! 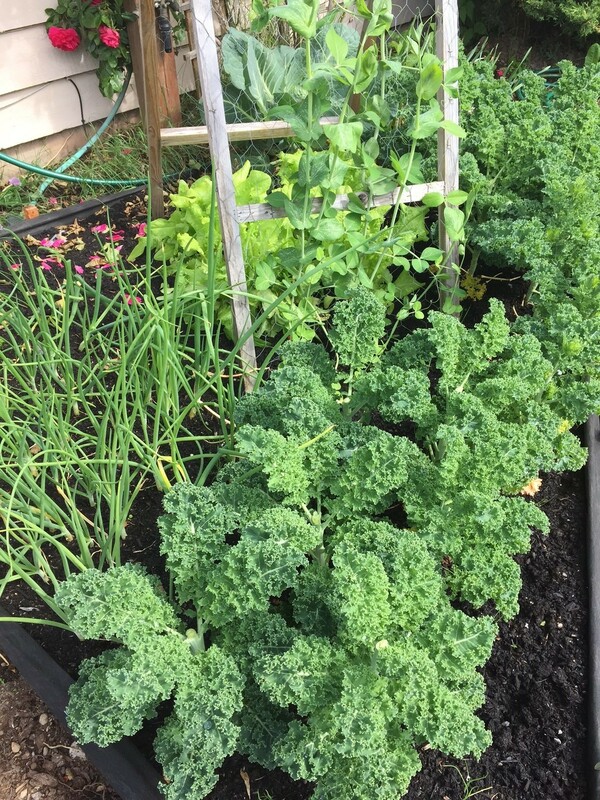 The kale in my garden is growing like crazy. The kale is in the front. There are three different varieties of curly kale. Lettuce is under the wooden structure while sugar snap peas are growing up the chicken wire. There are sweet onions growing to the left. In addition, carrots are behind the onions but they didn’t fit into the picture. This garden receives morning shade and afternoon sun. I started harvesting the bottom leaves on the kale plants because they were the biggest. This was a mistake. I learned later that I needed to cut the center stem out before it started to flower (aka “bolt”). By cutting out the top center, the kale plants are bushing out and creating new leaves and branches. I will continue to cut the newer leaves before they flower. I hope to be able to harvest through the summer. I am going to start a new round of seeds that should be ready for harvest when these are done. I will plant them in another section of my yard. I have several garden sections mixed with flowers. With chickens free range in the back yard, I had to be creative in the front. 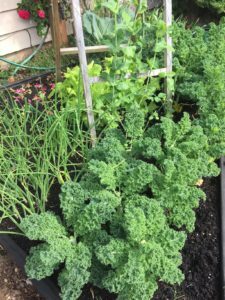 When my chickens were new, I had a batch of kale and lettuce starts to plant in my raised bed. It was on the side of my house, an area connected to the back yard. The next day I went to water my new seedlings and they were gone! There was a couple chicken poops left as evidence to let me know who the thieves were. I fenced the side yard garden away from the chickens now. I don’t know what I was thinking. So let me get back to the topic. You cannot deny that this is a delicious way to eat your greens. People have asked me what protein powder I like. I have tried many. My favorite brand is GNC Pro Performance AMP Wheybolic Extreme 60 Original. I use the chocolate for this recipe and vanilla with my berry and tropical smoothies. It is the smoothest and creamiest powder I have found. I mix it in at the end of my blending process because it gets frothy if blended with frozen chunks. Also, you have to try powdered peanut butter. This was a game changer for my smoothies. It is all the taste and none of the fat. There are even brands that include fax and chia seeds to make smoothie prep quick and easy. Please try this recipe and let me know if you like it. What a weekend at the urban homestead! It reminds me of a book I read called, “Feel the Fear and Do It Anyway” by Susan Jeffers. We started the weekend excited about getting a new barn shed that we plan to use as a woodshop. After several months of dreaming of having more space, we started looking at the quick sheds for sale at The Home Depot and Lowes. These seemed expensive after realizing windows and doors are “add-on’s” and it was hard to understand what the process was going to be to actually get one installed on our property. I also read many blogs and pinterest posts about building our own shed, but that seemed like too much work for our family. One day, while riding along as a passenger, I saw a company called “A Structure for Life” along the freeway. Their property had several sheds and small barn structures as displays. I immediately google searched and couldn’t find them. I am not easily defeated…I drove in the general direction and found their location the next weekend. Unfortunately, they are only open by appointment. I called their number and left a voicemail. After two voicemails, I received a call back. I set up an appointment for the next available weekend to view the example structures. I would have to wait two weeks because they would not be open on Memorial Day Weekend. When we met the owner, he was very nice. He had his toddler daughter with him. He answered all of our questions and showed us many samples. We ended up with a 12′ x 16′ shed that looks like a barn. The company is booked until July, so we will be waiting more before it arrives. I’m learning that waiting gives me time to prepare myself. In this case, we need to knock down lots of blackberry bushes, get a stump grinder and empty the old moldy shed to prepare a space for our new shed. The next day we started to tackle the blackberry bushes with the help of family and their very strong weed whacker and an electric chainsaw. After a long day of work, we sat on the patio to relax and quickly realized the air was full of bees! We watched with worry that our bees were leaving us. 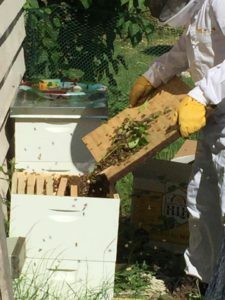 Our hive appeared to have lots of bees still coming and going as usual, so we hoped it was just the hive splitting because it had grown too large. The bees made their way to our neighbors back yard. As we watched, we could hear them closing their windows and doors. 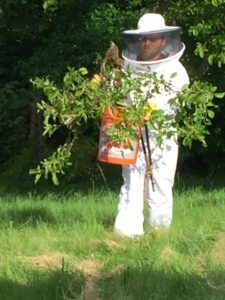 The bees were very interested in their crab-apple tree. They started forming a large clump. This is just what I had read about! 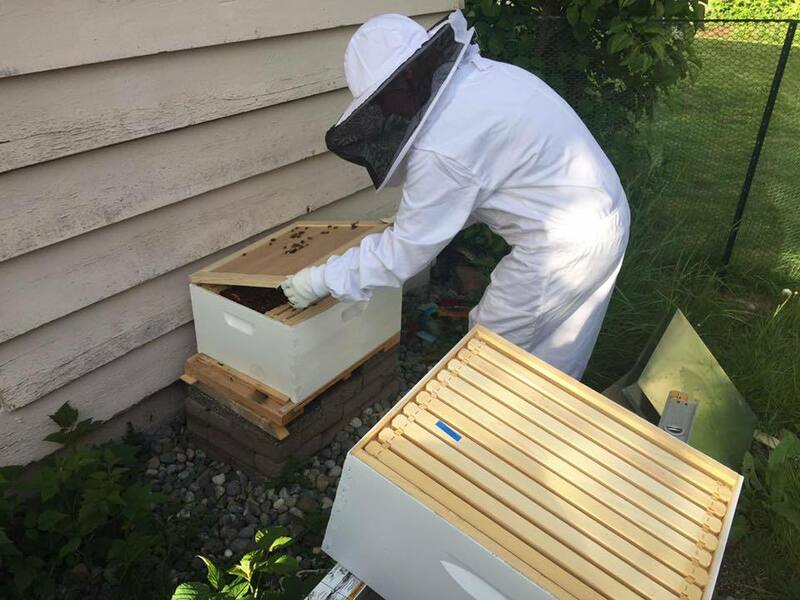 My husband suited up and I ran to the store to buy a second hive. This could be our chance to have two hives. 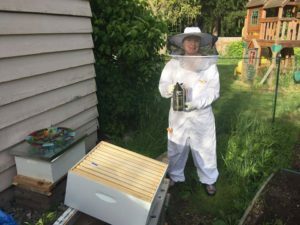 When I got back, we got all the bees we could into our new hive. After all this excitement, my heart was racing. I wasn’t afraid of the bees but the thought of losing the bees made me very sad. We didn’t know if we had the queen or not. The bees were leaving the new hive. There was nothing we could do, so we went out for Mexican food. When we returned the new hive was empty, but at least the old hive was still busy. We saw the bees were back in the neighbors tree. so we went and got them again. The were the hive in the morning when we woke up. I hope they will be there when I get home. I think I received the best Valentine’s Day gift I could imagine. My husband says I’m difficult to buy gifts for but I don’t understand why. I am not a romantic and I definitely didn’t want a box of chocolates! So for my gift, I received honey bees. Ok, well its not exactly like I unwrapped a box of bees…let me explain. 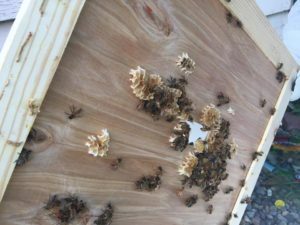 There are many steps to starting a honey bee hive. For Valentine’s Day my husband ordered bees for me and bought me a bee starter kit. I would have to wait until April to actually get my bees. This turned out great because I spent the next two months learning everything I could about bees. I researched the city rules to determine if I could have bees on my property and where. I found the local bee keepers association which was a wealth of information. I read many blog posts and urban homesteading books. 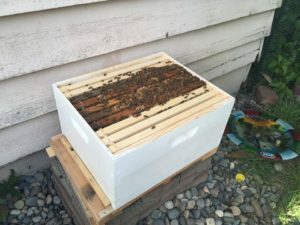 My favorite site is keepingbackyardbees.com. 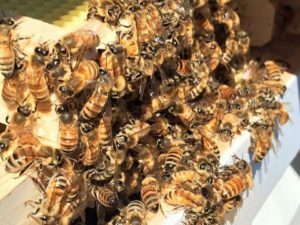 The family keeps bees and shares their many uses for the bees wax as well as the honey. After all of the research, I discovered I didn’t have enough supplies. As with any new hobby, the upfront costs can add up. Although I had the started kit, I realized I needed additional hive boxes. I ordered two additional 10-Frame Assembled Painted Hive Kits from Amazon. Finally, we received the notice that our bees had arrived at Coastal! Here you can see the 5-Frame Nuc box frames that were inserted into the brand new hive box. Here I am holding the inner hive lid. I left the bees alone for nearly one month before peeking into the hive. When I saw the bees started making honey comb on the lid, so I knew it was time to add my second hive box. Thank you for reading. Please leave comments and let me know if you have any questions or advice for me. 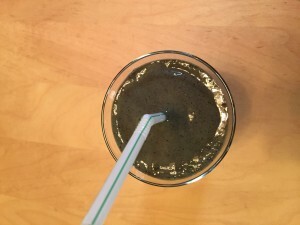 Dr. Oz’s Favorite Green Smoothie…Yuck! Today’s smoothie was so thick that the straw stood straight up. I followed the recipe except for the spirulina and macha powders. I couldn’t find either at Trader Joe’s. I did find spirulina tablets, so I put one of those in the mix. It was drinkable but did not taste good. I think there must be a difference between powder and tablets… The blueberries weren’t able to be recognized under the spirulina and spinach. I was very full until lunch time. I decided to look up what spirulina is, since I have just ingested it. Apparently I just ate algae! The website Nutrex Hawaii says it is considered to be the worlds best superfood. 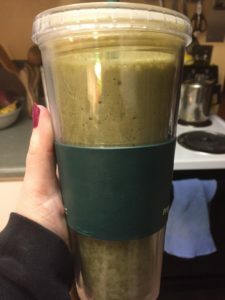 Perhaps I should order their powder and try to make this smoothie again. I also failed with a second smoothie for lunch. I found a recipe online for a lemon, ginger, mango smoothie. It called for flax seeds. I accidentally purchased “toasted” flax seeds. It smelled and tasted awful. I couldn’t even drink it. I hate wasting food but this was extreme. I decided to take my coworker up on her offer to buy me a burger to thank me for taking her to the eye doctor and ER last week. In the spirit of health , I ate the garden burger and only half of my french fries. After lunch, I felt tired and was even sleepy on my drive to an evening meeting. For dinner, I had a Fiber One Chocolate Oat bar and a banana. I’m full of energy again. Today I was back to my starting weight. 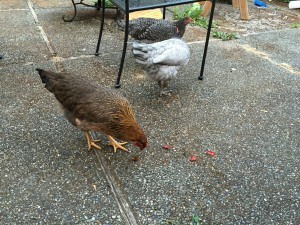 After coming back home, I shared a strawberry with my chickens. Only Goldie seemed to like it. The chickens are only four months old. We have not gotten any eggs yet. We are hoping for eggs any day.